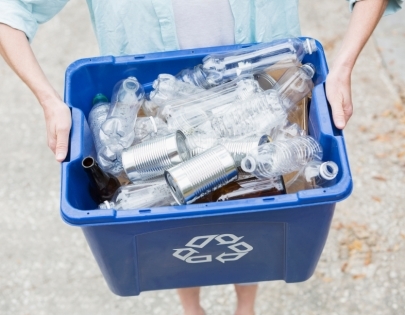 With nearly 9,000 different municipal recycling programs nationwide and inventive waste reduction programs across the world, the globe gets greener every year. In the U.S., more than 94 percent of Americans have access to local recycling, and anywhere it’s not encouraged, it’s required. As long as recyclables continue to sustainably satisfy America’s appetite for material goods, we’re content keep “reduce, reuse, recycle” on repeat. While the mantra is catchy, it’s perplexing to think that the pathway to energy savings is paved with plastic. How, exactly, does the environment benefit when we kick paper, cans and bottles to the curbside recycling bins? Recycling saves energy by eliminating the need to make materials from scratch. Regardless of which product you’re producing, it’s extremely labor intensive and energy expensive to extract, transport and refine the natural resources that go into aluminum, plastic, paper and glass. Using recycled materials rather than new resources gives us a jumpstart on the manufacturing process and allows us to make the same products with less energy. But there’s more to recycling than saving energy. Choosing to recycle materials that would’ve otherwise been sent to the dump substantially shrinks landfills, and using recyclables in manufacturing helps us conserve the natural resources on our planet. There’s no need to plunder for new timber, oil or ore when we can reuse what we’ve already removed. Recent statistics say that recycling keeps about 87 million tons of solid waste from hitting U.S. landfills each year – that’s about one third of the total trash we create annually. Aluminum is the most efficient recyclable around. With the amount of energy it takes to make one virgin aluminum can, you could make 20 recycled cans, and fast – the aluminum in your recycling bin can go from the curb to the grocery store shelf in just 60 days. These astounding energy savings are possible because aluminum never degrades. It can be reused indefinitely with no need to bring new materials into the production cycle. There are seven different types of plastic – each with different polymers and different purposes. Traditionally, most plastics have been “down-cycled,” or repurposed into low-grade materials like lumber, fleece or carpet fiber. Since production of new plastic accounts for 4 percent of the United States’ total annual energy consumption, down-cycling helps cut energy costs in the short term. But, since the material quality degrades each time plastics are down-cycled, it’s only a matter of time before your soda bottle heads to the trash heap. Fortunately, many manufacturers are now able to re-create high quality plastic products from these once-restricted recyclables. Manufacturing recycled paper uses only 60 percent of the energy needed to produce paper from fresh pulp – and saves thousands of trees in the process. Paper is consistently one of the most recycled materials in the U.S., but ink residue can create problems for manufacturers that make high quality, bright white paper. Emerging research on biodegradable inks and even erasable paper suggests improved recycling efficiency is on the rise. Creating glass from recycled materials rather than raw materials generates 20 percent less air pollution and 50 percent less water pollution, according to a report by the EPA. When you toss glass in recycling bins instead of trashcans, you’re helping to keep waste out of our landfills, preserve natural resources like sand, limestone and soda ash, and eliminate the transportation costs involved with moving these heavy materials. Recycling is one crucial step on the path to becoming more conscious of what happens to the waste we create. When you trade in your used bottles and cans, you’re trading up for a greater nation and a greener planet.